White paper on crime 2004 Part5/Chapter3/Section2/2. Aging has progressed among prisoners in line with the aging of society.The followings will examine the characteristics and the treatment measures of elderly prisoners. "Elderly people"refer to those aged65or over in general.However,many statistical data of the past lack in age classification of65years old.Therefore,"elderly people"refers here to those aged60or over,and figures for the age65or over will be presented only when statistical data are available. Fig. 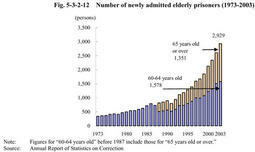 5-3-2-12 shows the number of newly admitted elderly prisoners since1973(see also Fig. 5-3-2-2 in 1(2) in this section).The number of those prisoners aged60or over increased significantly from341or1.3%in1973to2,929or9.3%(those aged65or over were1,351or4.3%)in2003. Fig. 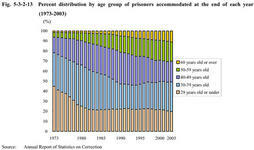 5-3-2-13 shows the percent distribution by age group of prisoners accommodated at the end of each year.The number of those aged60or over also increased from613(1.6%)in1973to6,683(11.0%)in2003,showing the rapid advancement of aging. Fig. 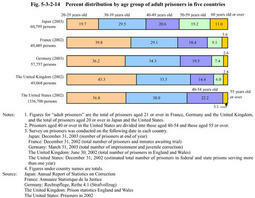 5-3-2-14 compares percent distribution by age group of prisoners among five countries,Japan,France,Germany,the United Kingdom,and the United States based on the latest statistical data available.The percentage of aged60or over was between2.6%and3.6%in France,Germany and U.K.,and the percentage of aged55or over in U.S.was3.1%.In contrast,that of aged60or over accounted for11.0%in Japan,which indicates that in Japan the aging rate is the highest compared to other four countries. Table 5-3-2-15 shows the percentage of elderly people(60years old or over)in the overall population in the above-mentioned five countries.Although the percentage of elderly people in Japan in2000was almost the same as Germany and showed no big differences from France and U.K.,the percentage of elderly prisoners is extremely high in Japan.This might be due to the rapid aging of Japanese society during the30years since1970,when Japan's age composition was the youngest compared to other four countries,where aging had already progressed considerably. Fig. 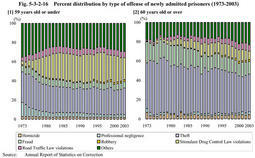 5-3-2-16 shows the percent distribution by type of offense of newly admitted prisoners,comparing prisoners aged60or over and those aged59or under. Compared with younger prisoners,elderly prisoners have low percentage of Stimulant Drug Control Law violations,while percentage of theft and fraud are extremely high.Among the newly admitted prisoners in2003,the eldest prisoner was89years old for theft,83years for fraud,79years for Stimulant Drug Control Law violation,79years for Road Traffic Law violation,85years for homicide,78years for robbery,83years for injury,78years for embezzlement and breach of trust,84years for breaking and entering,and85years for arson(Source:Data by Judicial System and Research Department,Minister's Secretariat,Ministry of Justice). Table 5-3-2-17 shows the top five offenses committed by newly admitted prisoners in2003,separating age groups and first-time admitted prisoners and readmitted prisoners.For elderly readmitted prisoners,the percentage of either theft or fraud is high,accounting for more than60%(60.6%of those aged60or over and63.3%of those aged65or over).As for elderly first-time prisoners,more than10%are for Road Traffic Law violations.Stimulant Drug Control Law violations are not included in the top five offenses,while homicide is ranked high.There observed are various patterns for elderly prisoners,such as those who have repeated imprisonment since they were young,dangerous drivers who are imprisoned for the first time at an old age,and first-time offenders who were imprisoned for a serious crime etc. Fig. 5-3-2-18 shows the percent distribution by frequency of imprisonment of newly admitted prisoners,comparing those aged60or over and those aged59or under.Even discounting the fact that prisoners with a history of imprisonment several times are generally old,elderly prisoners have higher rate of readmission than younger age groups with a particularly high rate of those imprisoned"six to nine times"or"ten times or more." Fig. 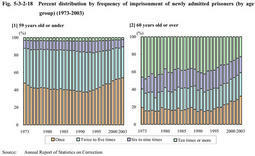 5-3-2-19 shows the distribution by imprisonment term of newly admitted prisoners sentenced to imprisonment with labor in2003.Except for a slightly higher percentage of elderly prisoners sentenced to one year or less,the imprisonment term distribution does not show any significant differences by age. Elderly prisoners suffer from mental and physical declines as they get older,and have peculiar problems in relations with their families and society,such as having no places to return due to their parents'deaths and having difficulties in making their future life plans etc.Each penal institution gives special considerations to all these problems in treating them. The present Classification Treatment System does not have any special category for elderly prisoners.Only those who suffer from some physical declines by aging or suffer from certain illnesses may be classified into Class P(prisoners who have physical illness or disability).Among the28,170prisoners released in2003,the percentage of Class P prisoners was higher with age,being0.9%among those aged59or younger,3.5%among those aged60or over,and5.2%among those aged65or over(Source:Data by Judicial System and Research Department,Minister's Secretariat,Ministry of Justice). Class P prisoners are accommodated in medical prisons or institutions specialized for medical treatment,and others are accommodated in ordinary prisons according to their confinement classes and receive treatment programs corresponding to their treatment classes.The classification categories for treatment include also Class T(inmates who need specialized medical treatment)and Class S(prisoners who need special nursing treatment).Among the28,170prisoners released in2003,Class T prisoners were1.0%and Class S prisoners were1.3%in the age group of59or under,while the former were3.3%and the latter were11.0%in the age group of60or over(Source:Data by Judicial System and Research Department,Minister's Secretariat,Ministry of Justice). As outlined above,more convicted prisoners are classified into Class P,Class T or Class S as they get older.Special attention is paid to elderly prisoners,even if they are not classified into those three classes,to maintain their fine health,and various considerations are also given to their waning minds and bodies and problems in their relations with society. In this respect,each penal institution has taken special measures as follows:(1)shortening their prison work hours,(2)setting them light duties like making paperware,(3)lending them more clothes,bedclothes,hot-water bottles,glasses etc.,and(4)detecting illnesses early and making utmost efforts in medical treatment etc. As among elderly prisoners,increases are found in(1)those who need care in overall daily activities such as walking and having meals due to a decline in basic physical strength,(2)those for whom much more time and energy is required for instruction on prison work or daily activities due to their waning intellectual and apprehensive powers,and(3)those who cannot keep up with ordinary schedules for meals,exercise,or moving about in the institution etc.due to their slow movement.Therefore,more penal institutions sort out elderly prisoners to provide appropriate treatment programs according to their characteristics.Such treatment is called"nursing treatment,"the contents of which vary in each institution.Some institutions establish"nursing factories,"where elderly prisoners are brought together to do light duties;some institutions promote barrier-free environments through providing handrails and eliminating differences in floor levels in exclusive areas f or elderly prisoners;and other institutions provide elderly prisoners with guidance programs covering topics such as health management,exercises,pension,nursing care,and social welfare.More details of programs are in Section3-4(2) in this chapter. Fig. 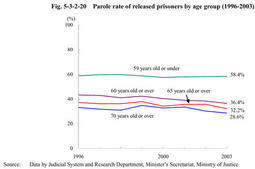 5-3-2-20 shows the parole rate among released prisoners by age group since1996. The parole rate becomes lower with age,and around70percent of those aged70or over are released after they have completed their sentences.This might be because some elderly prisoners have history of multiple imprisonment,and many of them have poor conditions for their reintegration into society,having no place to return or difficulties in finding jobs after release.Penal institutions provide them with guidance on finding their guarantors including halfway houses from the early stage of their imprisonment and probation offices also try hard to improve the environment of the places where they return after release.However,it is highly difficult to create better conditions for elderly repeat prisoners. Penal institutions give special consideration to the mental and physical conditions of elderly prisoners in their treatment,which is necessary and appropriate in line with the concept of individualized treatment. On the other hand,some elderly prisoners just repeat offenses and are imprisoned after their being released without suitable conditions for their reintegration into society.It is not easy to find drastic measures for those elderly repeat offenders,but we should avoid the situation of prisons having to play nursing homes for the elderly.Measures for such offenders will become even more important as the aging of society advances.